A few tips from my first no line coloring project with Copic markers and Honey Bee stamps! Happy Friday friends and welcome to Honey Bee's Bee Bold release hop! This release is full of so many great new sets and one of my favs is the Chin Up Buttercup set! To finish this card, I stamped a little field of poppies (buttercups) to create a background. 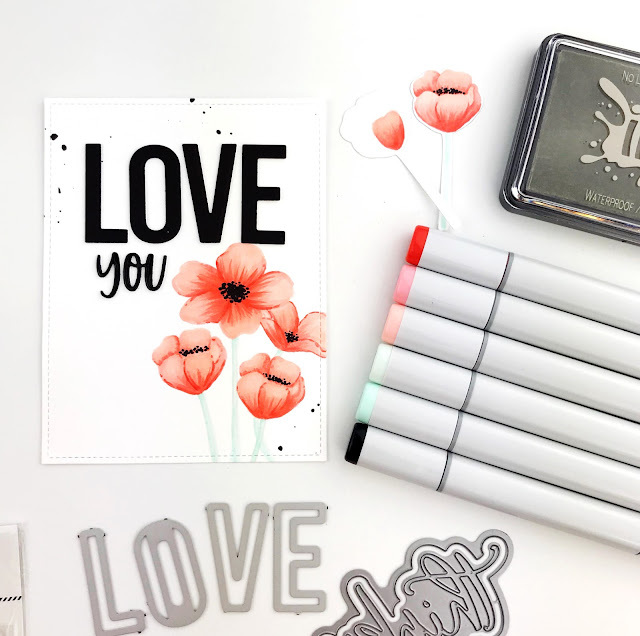 I layered my colored poppies on top, along with a sentiment created with Honey Bee Bee Bold Alpha and "just because" from the Honey Bee Cheerful Sentiments stamp set. For the second card, I stamped the poppies directly onto my card panel and no need to do any masking, just color accordingly! Love that shortcut! The sentiment is Bee Bold Alpha and "you" from the Thinking Of You die. Carly ---> you are here! Those flowers are amazing. I need to practice with my copics to try to be that good. The shading is impeccable. Love your color combination on this beautiful CAS card! It looks amazing!! Absolutely beautiful cards - love the CAS design, and those flowers are amazing! Lovely cards today! I like how you did the first one with uncolored flowers in the background to really highlight the popped up ones! Very cool. Unique cards using a POP of color. That buttercup flower is beautiful. Love, Love these cards! They are so beautiful!! 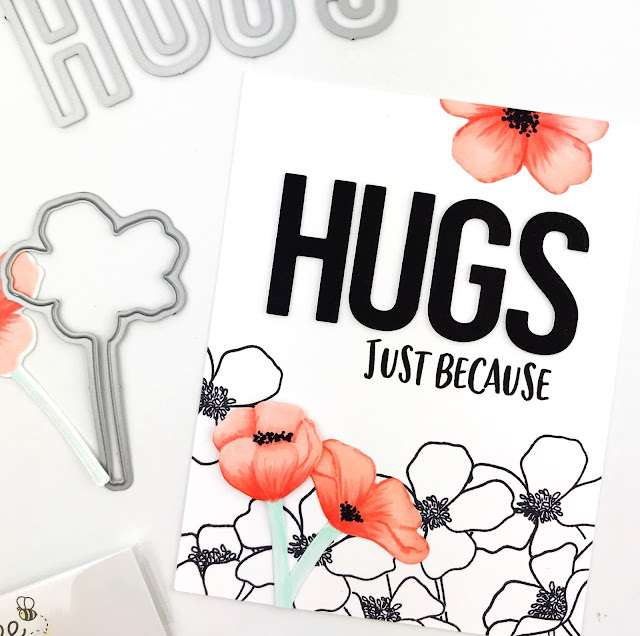 The Poppies stamped in black and left uncolored are super cute and then to add the colored poppies - that just makes the card! I love this card and now I want the stamp set. Your coloring of the flowers is beautiful. Definitely something I aspire to. Very pretty! Very pretty coloring of these gorgeous flowers. Love your card! Those poppies are adorable! Your no line coloring of the poppies is amazing. Love your cards! Love the buttercups and the alpha! Fabulous cards! Love your tips on no line coloring. I love the look plus the colors you used. Gorgeous design! I love the black/white with the bold pop of color. OMG! Your coloring is PHENOMENAL!!!!!!!!! So pretty! I'm off to watch the video! Beautiful card!!! I love your coloring and can't wait to get a moment to watch the video! I'm pretty jealous of your coloring game. This stamp set looks perfect for no line coloring too. I love the monochromatic background with those colored blooms as a focal point! Lovely cards - well done! Beautiful cards! I especially love the black stamps with the highlighted colored image on top. Beautiful!! Thanks for the video. Thank you so !such for a fab video. Your flowers are amazing, your colour work is so bright & realistic looking, got so much out of your video & cards. Thank you so very much. Lovely cards and designs - the pop of colour against the black and white, plus the big bold letters for the sentiment really look great! these cards are so beautiful! And, I love the video, too. Gorgeous card. Thanks for sharing the technique video and inspiration. These are SO gorgeous! Love the no line coloring and the color scheme of these is so stunning! Love them both! I never thought of no line colouring with Copics. I am going to give it a try. Gorgeous cards! I love the bold black words with the pop of color. I also have a black thumb, so I got quite a giggle out of your comment about killing cactus. Been there done that. Lol. I’m horrible with copics, but you made it look easy enough for me to give it a good try. I love the no line coloring effect. Beautiful cards. Hey..Your flowers are beautiful!! I can even begin to color and shade but you are doing a fantastic job!! a green thumb-your flowers are fabulous! coloring-I wouldn’t have thought of that. Lovely cards. I love the mix of black and white and no line coloring. Such a great idea! Love the black and white with a pop of color, super elegant! over the stamped background. Very pretty. Gorgeous cards!! The flowers are so pretty with your coloring!! Wonderful coloring on these gorgeous flowers! They look amazing! I love these cards! Such a pretty pop of color against the black and white card. Beautiful cards. Love those poppies! Love your no line coloring on these cards. Your cards are beautiful! Thank you for the no line coloring tips. I’ve been wanting to try this technique also. Your no line colouring is so great!! 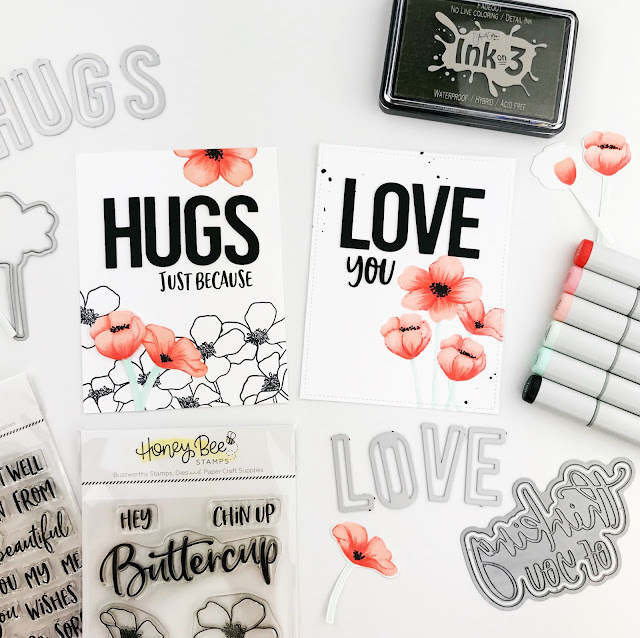 love that new buttercup stamp from this release and your cards are just gorgeous using it!! Stunning cards! Lovely designs and gorgeous coloring. Creative way to use the Buttercup stamp set and make Poppies. I have a black thumb too. Poppies are so gorgeous!!! Beautiful cards!!! Pretty card - love your coloring! I just love how you've incorporated the be bold alphas into your cards. The card designs are fabulous. Chin up buttercup is really a great set! Lovely shading. I like both buttercups and poppies. Simple but elegant. Nicely done. Your cards are beautiful and very elegant ! Wow !! You’ve made some incredible flowers ! Your coloring is just perfect !! Very nice cards love the pop of colour. WOW.. your coloring is amazing. Love the colors your choice. Fabulous no line coloring! Just gorgeous!! The buttercup flowers make perfect poppies when they are colored so expertly as you did. Terrific cards. Love your graphic black and white with a pop of color. I think the coloring on your flowers is beautiful! Those no line colored flowers look amazing, love them in contrast with the simple black and white! What a beautiful concept. I love the details of the no-line vs. the background of the outlines. I'm definitely going to have to try this idea. Thank you for sharing with us!